Our story - Kisoboka e.V. Africa. This continent has fascinated us for a long time. Where this came from, we could not explain so precisely. But it came from deep within us. The fascination quickly turned into a longing to finally get to know the continent and the people. And that far away from the metre-sized posters of aid organisations and the stereotypes of our Western reporting. Towards the end of 2013, our decision was made to travel to an African country south of the Sahara in the upcoming year. But how do you decide on a country? Especially when each country has its own appeal? We were lucky enough to experience one of those moments when fate supposedly distributed the cards and suddenly it was clear to us: Uganda. In the following weeks, we spent quite some time contacting people in Uganda via various online platforms and asking for guest rooms, because our great wish was to get to know the actual realities of people's lives and then - independently of an aid organisation - to help where help is needed and welcome. Finally, a very nice gentleman - who is today one of our close friends in Uganda - offered us his guest room and sent us ahead, he also knew a place where we could help: at a primary school/orphanage in Entebbe. Now that everything was sorted out, we impatiently awaited our departure for Uganda. We will never forget the 31st of July 2014, because on this day we entered African soil for the first time. We see it right in front of us as we get out of the plane and enter the tarmac, the sun blinds us and welcomes us to Uganda. The first days were a roller coaster ride of impressions: so many colours, smells and noises! And so many sincerely warm-hearted people. 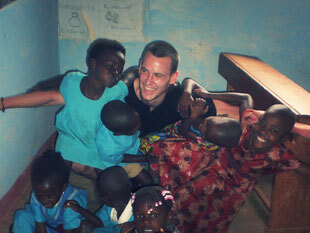 We lost our hearts to the work with the children from the very first moment on. 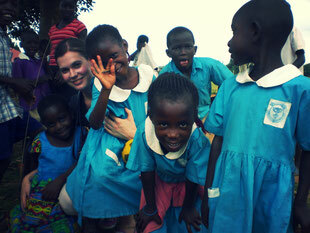 We spend every day with them teaching, playing and laughing from morning till evening. We feel at home in Uganda and the destinies of the people around us are never letting go of us. While we are still in Uganda, we begin to plan the foundation of a non-profit association in Germany. We are often asked about our reasons for doing so. There is not one reason, but it was a natural process. We didn't have to think about it. It just felt right. Meanwhile, Uganda has become our second home. In all these past years we have experienced a lot. Many wonderful things and of course also not so beautiful ones. Yet none of these experiences has ever made us doubt our vision to improve the lives of disadvantaged children through education and care and to give them the chance to lead a self-determined life. As a consequence, the whole country will benefit from this, because Uganda can only truly thrive if its children do so and exploit their potential.